It’s said that in villages where Sufism is practiced, conflict is settled via poets, one for each person involved in the dispute. Arguments are heard and then sung as poetry while people from the villages dance until they drop. In this way, music, trance, ecstatic surrender, and ultimately, peace become intertwined. 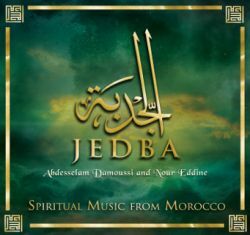 And it’s this notion of universal peace that Jedba attempts to conjure on an album several years in the making, a release that covers quite a bit of musical ground as it moves from Morocco’s Saharan south to its more fertile North. ARC, a label that has released records of Sufi music from Bangladesh, Turkey, Egypt, Pakistan and elsewhere, is continuing to give this kind of centuries-old devotional music a place to reinvent itself as it moves forward. Damoussi and Eddine, both musicians and producers with long and diverse resumes, assembled various groups of players who they then recorded in a variety of settings, including the streets and a Tangiers mosque. As a result, they managed to capture the essence of Moroccan music, stripped of glossy production, but with just enough professional sheen to make this ancient music sound forever current. There’s “Adan,” a solo a capella call to prayer typical of the country, a Berber rabab and banjo player from the Atlas mountains who features on “Tazalit,” and even an electric guitar and vocal track, “Arrahmane,” that features two players from the country’s deepest Saharan pocket and bears a clear kinship with the kind of suspended, meter-less plumes of sound found further south in the Western Sahara and Mauritania. As for the record’s allegiance to trance, nowhere is this more pronounced than on the track that gives this collection its name. With Eddine on percussion and Abdelaziz Inouiti on ghaita (a flute-like instrument that sounds like a windswept cousin to the bagpipes), the tune is relentless, at one point breaking itself down into a taut, repeated solo hand drum line. Finally, the ghaita re-enters just before the performance, which might have gone on forever, fades out. Damoussi’s voice and Eddine’s percussion are found scattered over much of this record, as it skitters from Berber banjo-driven grooves complete with call and response and the kinds of high-pitched ululations found across the African continent. There’s also an 8 year old girl’s voice giving shape to an Imam’s a cappella prayer ("Spiritual Mawal"). 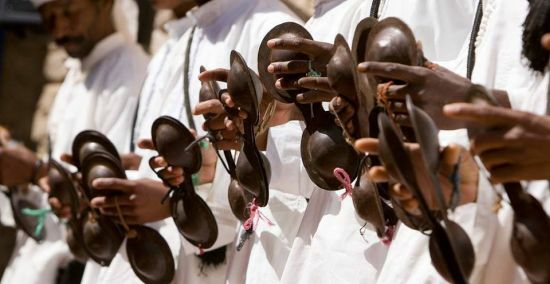 And on “Allah Hay,” ghaita and hand drums lead the way toward the album’s most involved vocal chant.